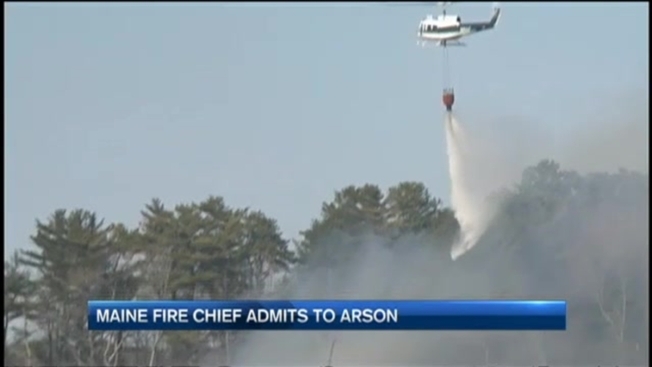 The fire chief in Old Orchard Beach, Maine, admitted to starting a brush fire last month, and blamed it on a cigarette, according to court documents. Ricky Plummer, 59, of Biddeford, was arrested early Saturday morning and charged with one count of arson in an April 15 fire that burned more than 42 acres in Old Orchard Beach's Jones Creek Marsh. According to the Portland Press Herald, Plummer has served as the fire chief in Old Orchard Beach since 2014. He has also worked at fire departments in Arundel, Biddeford, Standish, North Berwick and Gray, Maine; Portsmouth, New Hampshire; Marlborough, Massachusetts; and Cocoa, Florida. He made his first court appearance on Monday and his bail was set at $10,000 cash. He is not allowed to travel to Old Orchard Beach or possess incendiary devices. About a dozen investigators from the state fire marshal's office and the forest service seized computers at the Old Orchard Beach fire station on Friday. They also seized Plummer's town-owned car and his cell phone. Plummer does not yet have an attorney. Fire investigators said that, contrary to Plummer's account, no evidence of cigarettes was found in the area where the brush fire started. According to court papers, Plummer was spotted on surveillance footage arriving at the scene in his fire department vehicle. More than 100 firefighters from southern Maine fought the fire. Smoke was visible from as far away as Interstate 295 in Portland. No one was injured.